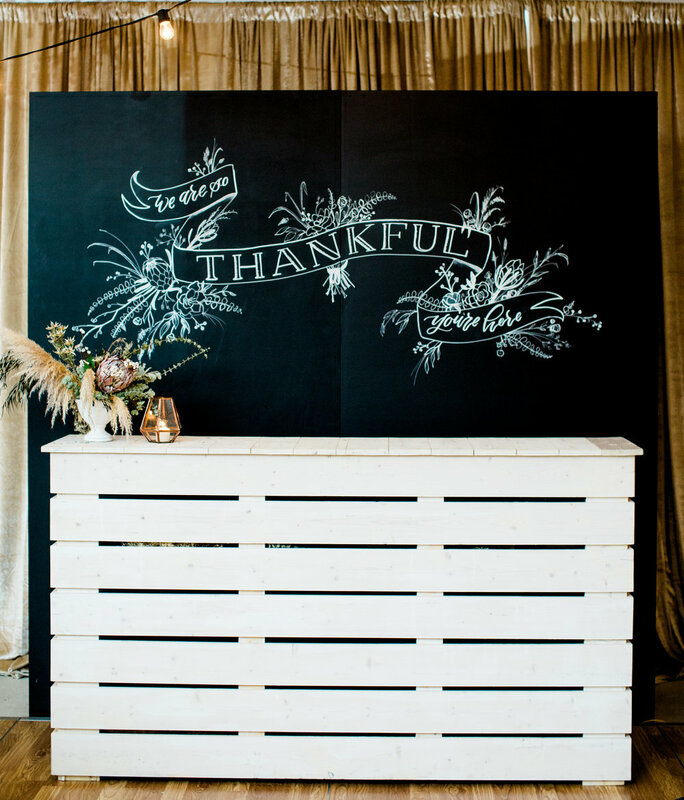 This past week I had a blast designing the November showroom for Marquee Event Group! I partnered with Alyssa at Color Theory Collective and Jess from Boarding School Collective to put together a romantic and trendy Thanksgiving table. The main goal with the color palette choices was to create a fall tablescape without using any orange. Everyone who knows me, may have seen my fondness for sienna based colors but that was not going to be a problem this week! 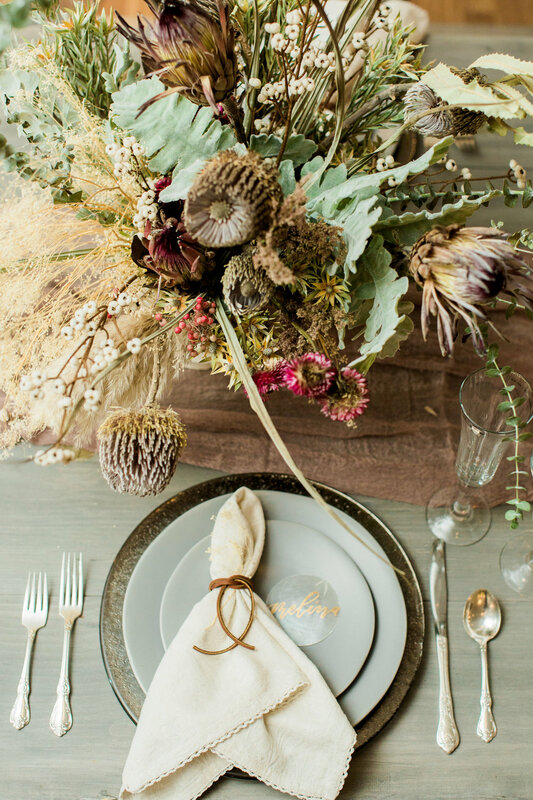 For this Thanksgiving table I wanted to focus on a moody romantic palette of mauve, grey, neutrals, greenery with accents of copper. I am in love with the Marquee driftwood tables and cane chairs so any chance to use those in a design is one I have to take. Each place setting was accented the pewter starburst charger, heirloom grey china, linen jacquard napkins tied with leather cord, capiz shell place cards with copper calligraphy, vanessa silver flatware and silver rim stemware. The trick with styling a showroom is that whatever design I put together has to last for a month. That's were Alyssa comes in with her amazing collection of dried floral, grasses and greenery. 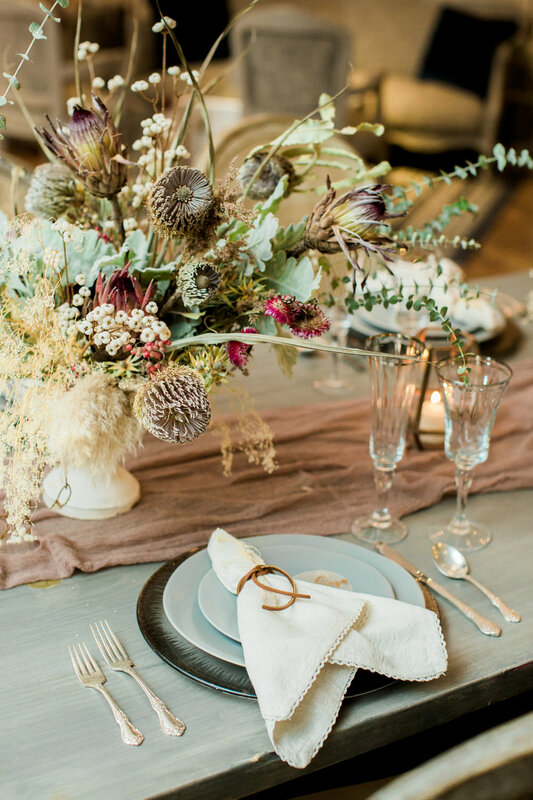 We filled out the rest of the table with a Silk and Willow mauve runner, copper lanterns and glass bud vases filled with dried grasses. Once the table was taken care of I still needed to fill the rest of the space. One of Marquee's new products is their chalkboard divider walls. Once I saw these I knew this was the perfect opportunity to showcase some pretty amazing artwork by Boarding School Collective. Seriously, Jess drew the entire mural free hand in the showroom! Dividing walls work really well as a back to any bar and sometimes I even prefer this to a stacked backbar shelving unit. To fill out the corner I added in the lovely Heather couch and chair collection and paired it with the silver steamer trunks as coffee/side tables. Over the seating area we centered a gorgeous bohemian beaded chandelier, a great addition to any lounge. Thank you Honey Gem Creative for the fabulous photos.